We hand build Top Quality Crystal Awards Crystal Trophies, Framed Plaque Awards & Client Recognition Programs that help companies motivate and encourage people who do great work. ASAP Awards creates custom recognition awards and gifts that you'd be proud to give or receive. We help companies “grow their business from the inside out” by recognizing and motivating People who do great work! We strive to educate our customers on the importance of Quality recognition awards and gifts to motivate and encourage employees and clients alike. Retaining great employees and great Clients is crucial to every business, and quality recognition programs are a key part of any retention strategy. Key performers need to feel appreciated, and a small old style brown wooden plaque or a bland certificate typically ends up set aside and not motivating the recipient. Make a Statement with any of our elegant designs such as a striking crystal award that they’ll be proud to display on their desk and motivated by feeling appreciated! Other employees will surely feel their competitive spirit kick in, and they, too, will want to achieve a similar award. The result is company growth and a shared sense of value and motivation. Our crystal award designs are created exclusively in-house, meaning our designs are found nowhere else. Our talented team create drawings to conception and then to inventory in our factory in St. Louis, Missouri. While most award companies only mark up and resell other (usually lower-quality) products, we do it all, so you can be assured that all of our products are premium quality built by our craftsman. Because we manufacture all of our own products, we pass the cost savings on to you. That allows you to offer your employees the highest-quality recognition awards for the lowest-possible price. We offer free artwork layout, free setup, free proofs, and free engraving. Your personalized text, images, and logos are added at no extra charge. That's it! Your product cost plus the method of shipping to your destination is all you pay, unless otherwise shown. All of our crystal products are made with high-quality K9 crystal, which is world-renowned for its clarity and smoothness. It’s the type of crystal used in lenses and prisms for lasers and optical equipment, so it has to be rock-solid. Our decoration method is vastly superior to other methods. We add your text and logo to the crystal award by hand with a process called deep-etch sand carving. With sand carving, a human hand aims a nozzle at the stencil that we produce with your artwork. The sand like media impacts the crystal at approximately 250 miles per hour. In doing so, the sand carves deep into the crystal creating your custom image. If you see the design on our site, it’s in stock and ready for your customization. We have real inventory shipped direct from our factory in St. Louis. The majority of award companies you will find online are re-sellers acting as if they have stocked goods, but then send your order to a third-party. 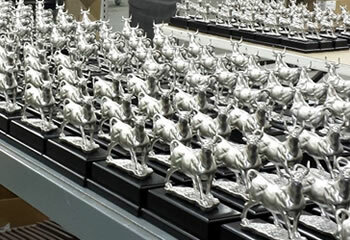 At ASAP Awards, our team builds and crafts every order at our facility, which means we have complete control to produce the best Quality and Service to impress!